Now that we are at the tail end of the hot, humid and dry summer we’ve had in Southern Ontario I’m looking forward to fall salmon season. With some rain forecasted this week (for the first time in a long time) it won’t be long until schools of salmon that are patiently waiting outside of the river mouths start making their way to their spawning grounds. Although Lake Ontario has been fishing well this year shore fishing has started off slow, which isn’t a surprise considering rivers were almost at a record low this summer. The rivers have been so low and warm that there haven’t been many sporadic early runs of fish pushing through like past years. Staging salmon have been keeping their distance as well considering how warm the water has been around estuaries and river mouths. I have been catching a few fish from shore already, but the action hasn’t been too notable. However, I did manage to score some eggs recently so I can get back into the lab to prepare myself for the next few weeks as the salmon will begin to come in thicker. 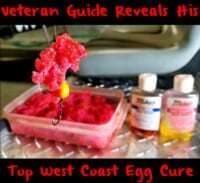 My egg cure is simple and a proven fish catcher. 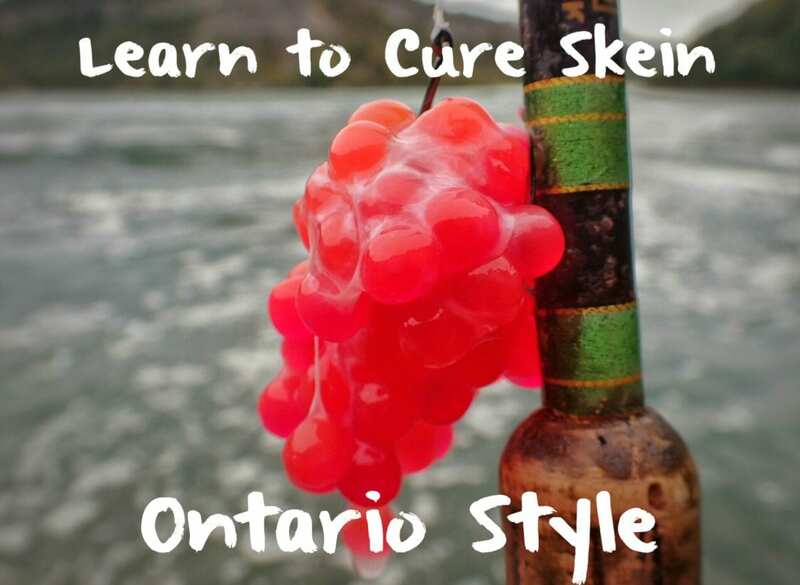 In this FireBlog!, I’ll walk you through the simplest way to cure eggs for float fishing, Ontario Style! The first step is one of the most important steps when it comes to curing your eggs. 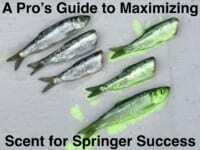 Make sure your fish has been thoroughly bled before removing the eggs. Make sure that your eggs go straight into a bag or a container and into a cool place after being removed from the fish. Your eggs have about a week of storage life in your refrigerator, so be sure to cure your eggs as soon as possible before they slowly start to spoil. Now let’s dive into curing the eggs. Lay out enough paper towel to nicely spread out your skeins. I like to make my paper towel platform at least a three-ply to prevent the paper towel from ripping when it comes to the mixing process. Open up your skein as much as you can until the membrane lays straight out and place the skein with the eggs facing down onto the paper towel to dry up a little bit. Once the skeins have dried up for a few minutes, start cutting your skein into chunks about the size of an Oreo cookie. While cutting your skein chunks, be sure you are cutting into the membrane as often as you can. The skein chunks with the most amount of membrane stay on your hook the longest. Lay out your cut skein chunks evenly on the paper towel and let them dry for another couple of minutes. It’s curing time. This is how exactly how I it, Ontario style! I like to use an even blend of both Fire Cure and BorX O Fire when I cure my eggs for skein fishing. My favorite colour for waters along Lake Ontario, Georgian Bay and Lake Huron is a combination of Red Fire Cure and Pink BorX O Fire. Whether you start with BorX O Fire or Fire Cure it doesn’t make a difference. Try to wear latex gloves unless you don’t mind your hands being slightly dyed in different colors. Personally, I give the eggs a light dousing of Red Fire cure followed by a very light dousing of Pink BorX O Fire. Once I have put in the two cures, I mix them well in the paper towel by rolling all the eggs in a pile and massaging the cure into the eggs as I mix. This process will take at least a couple minutes just so that all the skein chunks are covered thoroughly. This is the last step. Take your eggs and portion them into Ziploc freezer bags or a Tupperware. Once you have packaged your eggs, put them straight into the refrigerator to let the magic begin. You will notice that the skein chunks become juicy after the first hour of curing. This is completely normal when it comes to the curing process. Do not get worried, those juices will be sucked right back in. After 4-6 hours, the skein chunks will start to reabsorb almost all the juices. Once the skein chunks look full again, they are ready to fish! I fish wet and dry cures, so do not be shy to let the skein chunks dry out a bit prior to fishing. That was easy, wasn’t it? Natural and Orange BorX O Fire and Fire Cure are great colour choices to cure with as well. The beauty of curing your eggs is not only in how effective and appealing these eggs are, but the amount of time they last in your refrigerator compared to untreated eggs. I can leave a bag of cured skein chunks in the refrigerator for more than a month before they slowly start to spoil. I am ready to rock and roll at any given minute into October with the batch I have cured, if I haven’t used it all before then. Not having to thaw eggs regularly prior to your outing is a beautiful thing. Not only does it take less time to get your bait ready, it gives you some added sleep time, too! As a matter of fact, it’s raining as I type this! It’s just about go time! Editor’s Note: For more info on Bojangles and his Ontario fishing adventures and seminars please visit https://www.facebook.com/anglewithbojangles.